1935 Monaco-Trossi, a rare example of automobile use. The radial engine is an internal combustion engine configuration in which the cylinders point outward from a central crankshaft like the spokes on a wheel. This configuration was very commonly used in aircraft engines before being superseded by turboshaft and turbojet engines. It is a reciprocating engine. The cylinders are connected to the crankshaft with a master-and-articulating-rod assembly. One cylinder has a master rod with a direct attachment to the crankshaft. The remaining cylinders pin their connecting rods attachments to rings around the edge of the master rod (see animation). Four-stroke radials almost always have an odd number of cylinders, so that a consistent every-other-piston firing order can be maintained, providing smooth running. The debate about the merits of radial v inline continued throughout the 1930s, with both types seeing some use. The radial was more popular largely due to its simplicity, and most navy air arms had dedicated themselves to the radial because of its improved reliability for over-water flights and better power/weight ratio for aircraft carrier takeoffs. Although inline engines offer smaller frontal area than radials, inline engines require the added weight and complexity of cooling systems and are generally more vulnerable to battle damage. The vast majority of radial-engined aircraft designed since the 1930s were also were fitted with NACA cowlings to reduce drag and to also enhance forward thrust by virtue of its airfoil effect. Originally radial engines had one row of cylinders, but as engine sizes increased it became necessary to add extra rows. 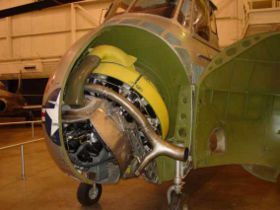 Most did not exceed two rows, but the largest radial engine ever built in quantity, the Pratt & Whitney Wasp Major, was a 28-cylinder 4-row radial engine used in many large aircraft designs in the post-World War II period. The USSR also built a limited number of 'Zvezda' engines whith up to 56 cylinders. The 42-cylinder diesel boat engines featuring 6 rows with 7 banks of cylinders, bore of 160 mm (6.3 in), stroke of 170 mm (6.7 in), and total displacement of 143.5 liters (8,756 in³). The engine produced 4,500 kW (6,000 hp) at 2,500 rpm. At least three companies build radials today. Vedeneyev engines produces the M-14P model, 360 HP radial used on Yakovlevs, and Sukhoi Su-26 and Su-29 aerobatic aircraft. The M-14P has also found great favor among builders of experimental aircraft, such as the Culp's Special, and Culp's Sopwith Pup , Pitts S12 "Monster" and the Murphy "Moose". 110 HP 7-cylinder and 150 HP 9-cylinder engines are available from Australia's Rotec Engineering. Miniature radial engines for model airplane use are also available from OS and Saito of Japan and Technopower. The Saito firm is known for making three different sizes of three-cylinder radials, and a five cylinder example. While the vast majority of radial engines have been produced for gasoline fuels, there have been instances of diesel powered engines. The Bristol Phoenix of 1928-1932 was successfully tested in aircraft and the Nordberg Manufacturing Company of the US developed and produced a series of large radial diesel engines from the 1940s. To reduce the chance of engine fires, in 1932 the French company Clerget developed the 14D, a 14-cylinder 2-stroke diesel radial engine. After a series of improvements, in 1938 the 14F2 model produced 520HP at 1910 RPM cruise power, with a power to weight ratio near that of contemporary gasoline engines and a specific fuel consumption of 166g/hp/hour. During WWII the research continued, but no engines were mass-produced because of the Nazi occupation, and by 1943 the engine had grown to produce over 1000hp with a turbocharger. After the war, the Clerget company was integrated in the SNECMA company and had plans for a 32 cylinder diesel engine of 4000hp, but in 1947 the company abandoned piston engine development in favour of work on the emerging turbine engine. The Nordberg engines were initially designed for electricity production in aluminium smelters. They differed from the norm of radial design by using two opposite cylinders as a double master instead of single master rod usually found, and managed to run perfectly circular. The engine design also permitted even numbers of cylinders in a single row with the cylinders being fired in consecutive order. The engines were a two-stroke design and were also available in a dual-fuel gas/diesel model. A number of powerhouse installations utilising large numbers of these engines were made in the US. ↑ Nordberg Diesel Engines. OldEngine. Retrieved on 2006-11-20. It uses material from the Wikipedia article "Radial engine". This page was last edited on 1 February 2008, at 23:07.